Eritrea is the origin of a significant share of the mixed migration flows seen both in the Greater Horn of Africa and farther afield in North Africa and Europe. The limited data available suggest up to 5,000 people leave the country every month. At the end of 2015, the United Nations High Commissioner for Refugees (UNHCR) estimated that more than 411,000 Eritreans were refugees or in refugee-like situations—and this is likely an undercount, considering many do not register with authorities. They join an Eritrean diaspora estimated at more than 1 million—a sizeable one considering Eritrea's total population was just over 5 million in 2015. Eritreans pose a special case among displaced populations due to the reasons why they leave their homeland, the manner in which they do so, and the special risks and vulnerabilities they face in transit. Many Eritreans cite their country’s conscription policy for all adults between ages 18-50 as the main reason underpinning their decision to move; other key factors include poverty, a lack of opportunities and freedoms, and inadequate government services. Even in a region characterized by mobility, Eritrean refugees stand out for the frequency and distance of their onward movement. This mobility challenges traditional concepts of refugees as static populations and raises questions about how to provide effective protection. This report sets out how Eritreans access protection in neighboring countries, North Africa, and—increasingly—Europe. 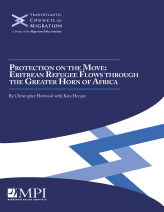 It examines the routes Eritreans take, identifying the risks they face during their journey, before considering existing national and regional provisions for protection, and how countries within and outside the Greater Horn of Africa can remedy some of these protection gaps.